Awards season is in full swing and all of the buzz has been leading up to this: Oscar Nominations. Here are James' predictions. Awards season is in full swing and all of the buzz has been leading up to this: Oscar Nominations. 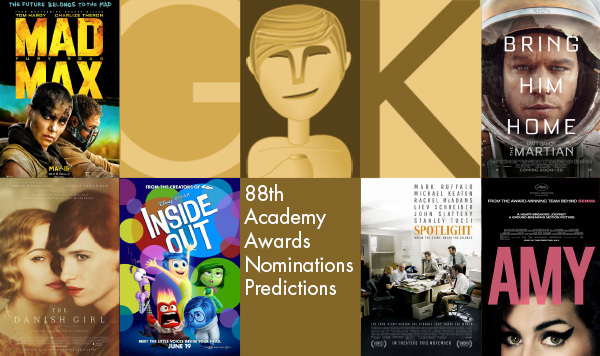 We've seen the nominations from the Screen Actors Guild and the Hollywood Foreign Press Association (even if it doesn't quite predict the Oscars), along with other guilds. Members of the Academy will weigh in Thursday morning with their thoughts. Please share your predictions by commenting on this post or on Facebook or interacting with us on Twitter. Nominations will be unveiled Thursday, Jan. 14, in a two-part presentation live from the Academy’s Samuel Goldwyn Theater in Beverly Hills, Calif., starting at 8:30 a.m. ET / 5:30 a.m. PT. You can watch the announcement right here on TheGoldKnight.com.